Happy 2018, friends! If you’re still recovering from New Year celebrations (and/or a whole lotta holiday travel like us! ), I have just the recipe to kick off your January. 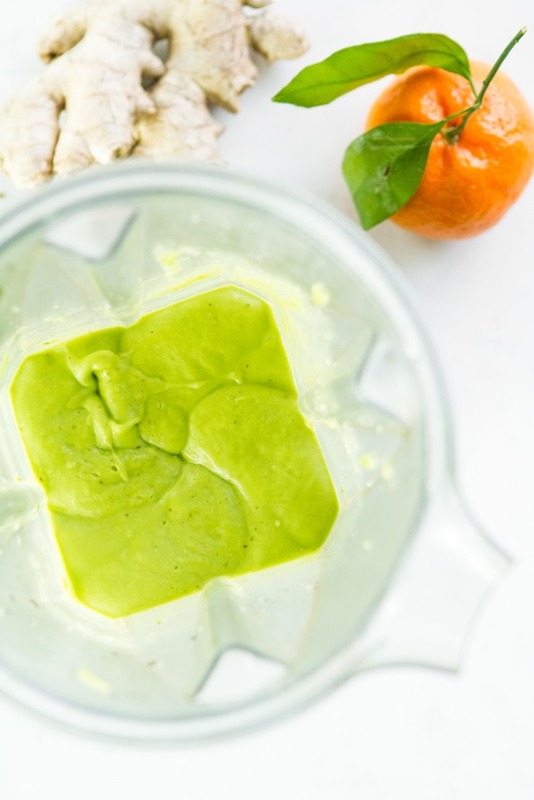 It’s refreshing and light with an immune-boosting bonus—something I think most of us could use right about now! I know I could. Now about those flights!! Oh man. Arlo is now 15 months old and very active, so he was our biggest challenge on the four-hour flight to Alberta. Nothing kept him happy for long, and we tried everything: toys, snacks, iPads, nursing, walks, etc…. He just wanted to move and get off that flight! Who can blame the little guy?! Arlo definitely inherited his “can’t-sit-still” gene from his mama. We also had an eventful trip home, to say the least! First, our carry-on bags were flagged going through security (they said it was due to some small baby food pouches—apparently their texture can trigger the alarm even when removed from the bag), so the screening officers pulled us aside and spent about half an hour going through everything (and I mean everything…they opened every single marker cap, searched Eric’s wallet, and asked us additional questions for their documentation). Even poor Arlo was patted down. At that point I was starting to feel emotional, but tried to hold it together because we needed to focus on making our flight. I have a lot of respect for the security process, but this threw us for a bit of a loop. We made it to the gate just in time! Then, about halfway through the flight, Adriana had an allergic reaction. Luckily it wasn’t severe and she’s totally fine now. The concerned cabin crew called a medical emergency over the intercom and told everyone to clear the aisle. A doctor on board the flight rushed to check on her and everyone nearby turned to see what was wrong. He was such a kind man and had a wonderful bedside manner (aisle-side manner, lol?). Boy, an experience like that really makes you appreciate the GOOD people in this world. During all of this, Arlo was super fussy, nursing- and nap-striking through the whole fiasco. And I was SWEATING, lol. At one point Eric looked at me and said, “We are officially that family on the flight!” Bahaha. Travelling with kids is so humbling, isn’t it? If I had a free hand on that flight, you can be sure it would’ve had a drink in it! Needless to say, we are very grateful for all of the kind people who helped us and to have gotten home safely in the end. I hope you all made it through your holidays okay too! 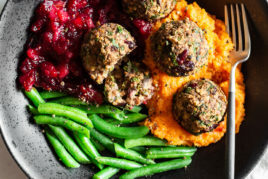 Okay, back to the energizing recipe that kept me powering through our holiday shenanigans! I created this smoothie in December for a fun TV segment with etalk’s Traci Melchor. 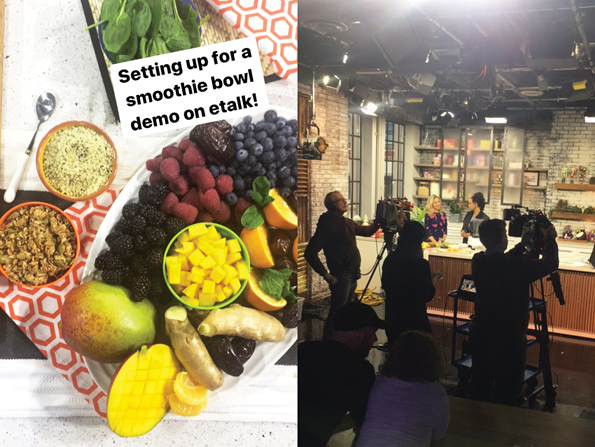 I’ll be sure to share on social media when the episode is scheduled, so please stay tuned if you’d like to see us in action and catch all the smoothie-making fun! It should be airing this month. I had such a blast chatting with Traci about all things breakfast and OSG. She and her kids are also huge smoothie fans and make one every day. Luckily (and to my huge relief) everyone on set LOVED this bowl—including the cameramen! They were feasting on leftovers after our show. I wish I had a picture of that. It was a proud moment. 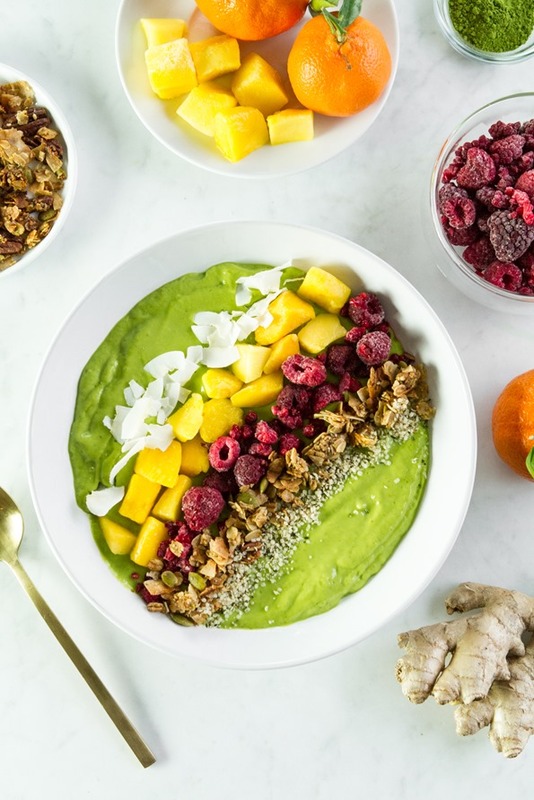 This creamy, dreamy, tropical green smoothie bowl is perfect for giving yourself a bright boost during the winter months! Mango and clementine add a tangy burst of flavour, and these nutrient-packed fruits are a great way of sneaking in some extra vitamin C during cold and flu season, too. 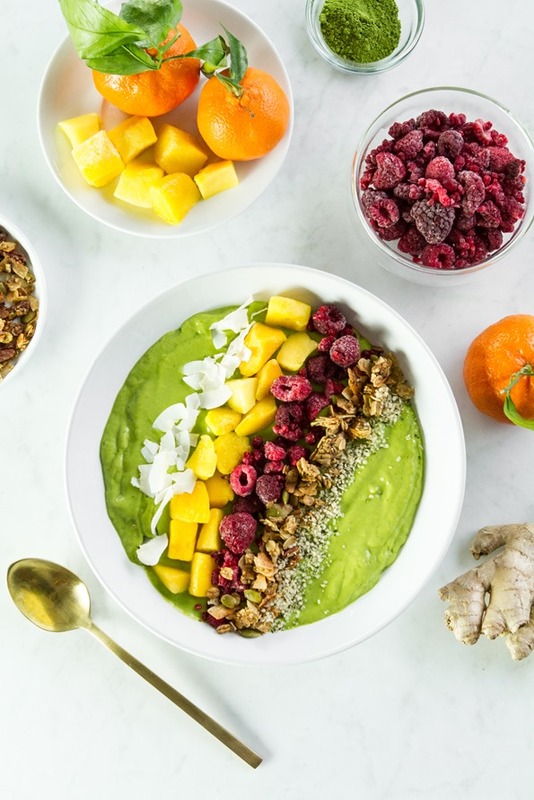 Anti-inflammatory ginger is great for digestion, and avocado lends this smoothie bowl a thick, creamy texture. 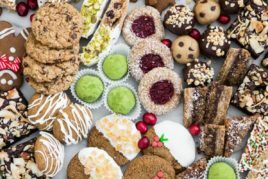 If serving to kids, you may want to omit the matcha green tea powder (due to its caffeine content) and ginger (which can be a bit spicy for little ones). If you’d like a portable smoothie on-the-glow, feel free to thin it out with more liquid and pour into a thermos for easy drinking. 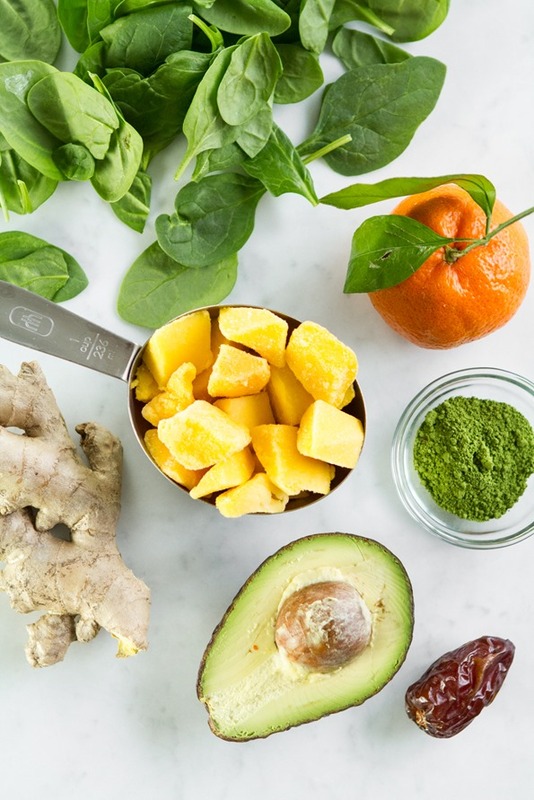 Since there’s no banana in this smoothie, I find that it can be made the night before without impacting overall flavour and texture the next day. 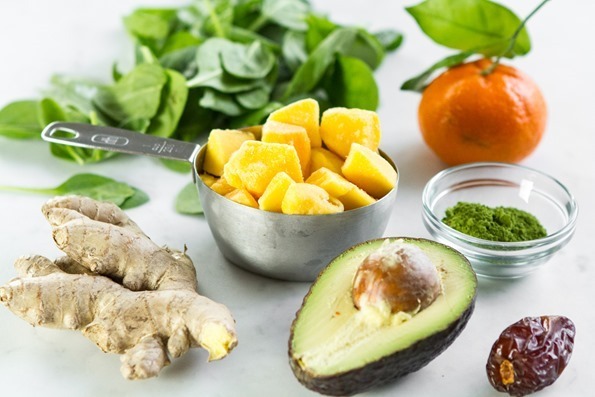 Add the water into a high-speed blender followed by the rest of the smoothie bowl ingredients. Blend on high until smooth. Pour into a bowl and add toppings as desired. Serve and enjoy! * Feel free to use coconut water if you like a sweeter smoothie. ** If your blender has a hard time blending dates smooth, you may want to swap the date out for a teaspoon or two of pure maple syrup. It also helps to use a very fresh date as they’re softer and blend easier. You may also be able to omit the date all together and use coconut water as your base for sweetness. *** You can find the recipe for this granola in Oh She Glows Every Day, p. 33. **** If fresh berries are out of season, feel free to use frozen or swap them with banana slices for your topping. By the way, if you are an OSG App user, you can also find this recipe in The Oh She Glows Recipe App (iOS/Android)! I love the sound of this but what can I substitute for the avocado? Hey Robin, Thank you! 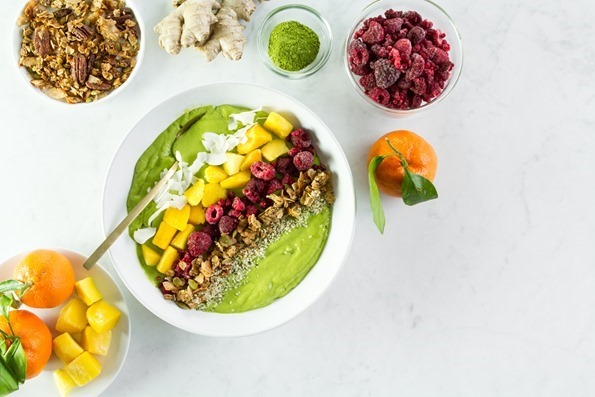 The avocado is what helps make the smoothie bowl thick, but you may be able to swap it with an equal amount of frozen banana or mango. Please let me know if you try anything out! 1/4 cup of soaked/drained cashews (or sunflower seeds) works as a pretty good substitute for the avocado, too! The cashews would of course make the recipe not nut-free, though. We are always “that” family on the flight! We flew to Hawaii when my daughter was three and son 11 months old and we didn’t get a single nap the whole 6.5 hour flight (from Alberta)…we’ve experienced gastro on the airplane…and when my daughter was two the same thing happened in security and she also got a pat down. This was also at the Calgary airport (why, yyc?) and we nearly missed our flight! On one of our more recent flights the lovely WestJet flight attendant gave me a free mini-bottle of wine and said “looks like you could use this” ha! We’ve been through it all! It is certainly humbling and has made me a much more empathetic traveler (human?). I will never complain about a baby or a kid on a plane again! Glad to hear your daughter was ok! We are about to head back to Hawaii with my now-three year old son…I’m thanking God he can finally tune into an IPad for a Paw Patrol marathon! Thanks for the lovely recipe. Will be trying this tonight! Lol…Oh April, I can relate. I swear, hearing other parents war stories makes me feel so much better. I really hope your flight home is a smooth one though! We also found that Adriana was so much easier to travel with at 3 years old. It was our easiest trip with her yet (aside from the newborn days). There were just a couple small incidents, but nothing like Arlo! He doesn’t do well with confinement. I definitely debated wine, but figured there was a 99% chance he’d fling it across the aircraft, LOL. Anyway, safe travels..and happy new year to you and your fam! Security check + cranky hungry toddler + preschooler with allergy attack + stuck on a plane, yikes! So happy to hear that the rest of your holidays were wonderful! Thanks to my CSA delivery (because going shopping in -20C yikes!) I have all the ingredients on hand for this fresh frosty smoothie bowl. I didn’t go overboard with indulgence on the holidays, but I didn’t work out even once and I may have forgotten what vegetables look like…I’m a bit granola and grained out and this smoothie looks like just the thing to break me into a new cycle. I saw your email that you enjoyed this smoothie bowl..so happy to hear that! It’s quite a refreshing one this time of year. I love the flavour the clementine adds. We can’t keep them in stock that long in our house though because Adriana LOVES them. Happy New Year to you and the fam! Just popping in to rate the recipe! haha thank you! So happy you loved it! Nice! I’m a mango enthusiast so I love the addition of dried mango AND fresh. Never tried hemp hearts – I’m assuming maybe Whole Foods might have them. Don’t know if my smoothie bowl will look as pretty but I’m definitely down to try since this is simple enough for me to try out! Oh yum and so pretty! Am I the only one who “bribes” herself with healthy food by making it look artful? :P If I wanted to reduce the sugar content and up protein, I was thinking about adding some nut butter or coconut butter to the smoothie mixture, and maybe adding chia seeds and/or flax. Would love suggestions (I have to do low sugar, even with fruits). This is definitely getting a Vita(mix) whirl this week, as I’m craving healthy foods after the New Year! Hey Kathy, I think coconut butter would pair nicely with these flavours for sure, although it’s not high in protein (only 1g protein per tbsp). The hemp hearts sprinkled on top are a nice boost of protein, or you could try adding in a bit of your favourite protein powder (keeping in mind it changes the flavours quite a bit). Hope this helps! Those of us who have been in the trenches as “that family” in the past (my daughters are 21 and 19) are sympathetic to you young families. If I can catch a young parent’s eye, I usually offer to take a stroll with a fidgety toddler or read a book or something. After all, it helps everyone on the plane, not just the parents. My youngest is home from college, and always looking for make-ahead-able smoothies for busy weekdays when it’s hard to get her veggies. She agrees this is perfect. Those gestures make all the difference, don’t they? I try to do the same now too. It’s amazing what a simple few words of encouragement or a helping hand can do. Omg! I have to say, I am not a 100% on board with the smoothie bowl trend. (IDK the whole cold soup aspect throws me for a loop). 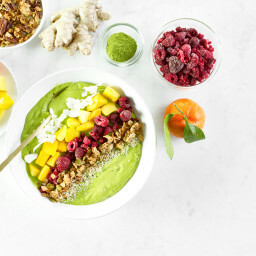 This smoothie bowl looks amazing, I would never have thought to combine matcha and ginger. 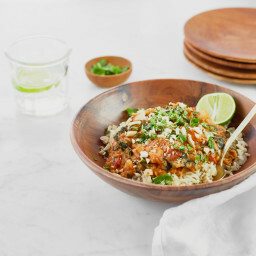 I might just have to try this whole bowl thing after all! It took me a long time to get behind smoothie bowls too because it’s extra work, but they are a fun treat now and then. I’d love to know what you think if you try it out. “thankfully, you don’t normally see the airplane passengers after returning home!” that’s what I always say too. ;) It’s like…let’s just pretend that flight never happened, deal? Enjoy the smoothie if you make it! Sounds like you’ve got your hands full over there. This looks great! Do you have any suggestions on what to substitute for the spinach? I can’t eat spinach, and I find it’s used so often in smoothie recipes. Hey Julia, I’ve used baby kale with great success in this smoothie. Maybe that’s an option for you? Good idea! I’ve used regular kale, but the texture is always grainy (using an immersion blender to mix). I will try that. Thanks! Oh good point…I do find the baby kale is easier to blend! And a bit milder flavour too. Wow, what a story!! You guys are troopers!! Nice to hear people helped out when they were needed, still good people out there! Thanks for the recipe, I am fighting a cold so this is exactly what I needed today…can’t wait to try it! Happy new year, all the best in 2018! Yes, there are some awesome people out there. :) I wanted to get his name to send a thank you, but he was gone by the time we got off the plane. He’ll be the doctor that got away, I suppose! lol. I hope you feel better soon, Karen! Angela, I made this smoothie last night and it is wonderful!! Didn’t have any clementines on hand so used oranges instead, but will definitely try the clementines next time. Also, having come out a little thinner than anticipated I just drank it out of a glass, which was just what I was looking for! Thanks for the lovely recipe, and hope you have a great new year! This looks like it will do wonders for eczema skin! Excited to try it! 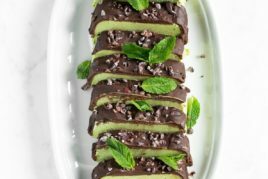 I tried this recipe and loved it! I did leave out the matcha tea powder. Even My daughter Loved it! We became vegan only 2 years ago and she is having a hard time embracing the vegan food. She (and I) Enjoy your recipes more than any others! 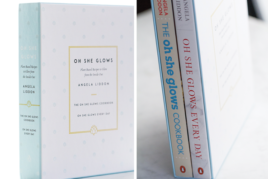 I have bought both of your cookbooks and hoping your app will someday be made for my Kindle Fire! Feel like we are missing out on so much! Thank you for recipes we can eat everyday!! Thank you for the kind words, Brenda! That’s so nice to hear that your daughter loved it as well. I really appreciate your support for my recipes and cookbooks too. Happy New Year to you and your family! Dear Angela, I wish you and your family a very very happy new year! Hope 2018 brings you everything you’re wishing for. One thing I really appreciate about you is that you always keep it real. Your photography is so beautiful, but you never make us think that this is how things always look in your home – your life and kitchen get messy too:) I know it sounds silly but it really makes all of us feel less alone. I remember it made my respect for you grow even more when you showed a picture of your messy kitchen after a ton of baking and cooking (for your cookbook I think it was) This is so the opposite of what people tend to do on instagram, and I love you for it! The experience on the plane sounds sooooo scary, I would have been a puddle on the floor lol. Hey Rachel, I’m so touched by your comment…thank you! That really means the world to me. I know what you mean about Instagram too. I find I have to step away from it at times because the perfect images are just too much! I will keep your words in mind and try to share even more messy/behind-the-scenes stuff as much as I can. ;) Be careful what you wish for…hahaha. I hope 2018 is off to a great start for you! Hi, I was wondering which brands of hemp hearts you like? Also, do you use bee pollen? I live in Tokyo so may have some difficulty finding these….any substitutes? Hey Carmen, I use Manitoba Harvest hemp hearts as they’re Canadian but any brand will do! Also, the hemp hearts are optional for this recipe so if you can’t find them not to worry. I don’t use bee pollen but if you do you could add some on top instead! Hope this helps. I am not so sure about a smoothie bowl..Is it like cold soup? Smoothie bowls are basically extra thick smoothies :) So the toppings (if you use them) float on top rather than sinking. I’d love to know what you think if you try it out! I’ve never put ginger in smoothie before. Sometime I will try it tomorrow. Me too Emma, until recently. I’ve tried at least 3 smoothies now with ginger and turns out I love it! My husband, however, will take some convincing ;) I suggest adding in a little piece, and then go from there. Thanks Kayla! :) I sure did. I remember the ladies from the Podcast One Bad Mother was on a cruise with her family. Her husband was performing on the cruise, and she decided to keep her kids on Californian time, the cruise was on a very different schedule, which ended p working perfectly. The kids were up late at night but it was when all the fun stuff was happening, and they weren’t bummed when they had to go to sleep because the cabins had such small windows, aka dark enough for sleeping. So it worked out perfectly for her. Oh that does sound like it worked out perfectly!! We were the reverse on our trip (up early/bed early) since we were going east to west, but it still worked out fine since it gets dark so early in the late afternoon/evening. I would make two modifications here. First, don’t peel your ginger. Ginger peel has as much medicinal value as the rest of the root. Plus, it’s such a tedious process. Two, I would skip all sweeteners in the granola. In my experience, there’s already so much sugar in the fruit that there’s no need to add more. I make my own granola every few weeks and it stores fine in a cabinet at room temperature. As long as it dries out thoroughly during and after toasting, I don’t have a problem with spoilage and have never needed to keep it in the fridge. Hey Ben, Peeling ginger is tedious for sure! I don’t typically peel mine as the Vitamix does a great job blending it completely smooth. For those without powerful blenders though I would recommend peeling it. I was looking for a reset after all the indulgent food eaten over the last few weeks. Just made this smoothie bowl and it was delicious!!! Thank-you Angela for your wonderful recipes. I also have a 15month old boy and I am a bit fearful of our first flight with him too.. but we have lots of parent friends who’ve gone through it (with stories like yours haha) so it helps put our minds at ease a bit more. Hey Kate, I hope my story didn’t scare you..haha. I’m sure your little guy will do great! It was an all around “off” day for us. ;) I’d love to hear what you think of the smoothie if you try it out. I’m obsessed with adding avocado in my smoothies…so fluffy and thick! 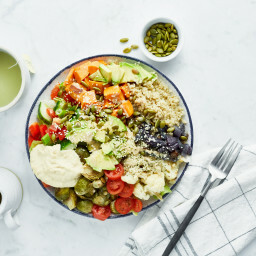 This bowl looks amazing, I just bought some matcha so I’ll have to try it! When we flew internationally with my then 11-month old, he cried hysterically for the first two hours of the flight. He is such an easy going baby so this was really out of character and I was sooo flustered (it was an overnight flight and everyone was trying to sleep). Luckily we survived and four months later my husband and I laugh about it. Oh Mallory, I feel anxiety just thinking about that flight experience. Totally been there! Time seems to tick by so slowly too. lol. I can’t stop making this!! Love LOVE this smoothie bowl. and basically all your recipes!! I noticed the raspberries look dried, where do you get them? Are they dehydrated or freeze dried? This is really delicious, better than I expected. I followed the recipe exactly and it was perfect. I made a whole bunch and they are in the freezer so all I have to do is take the chopped combo out and put in a vitaminx with water. I froze the avocado, clemantine, added green tea as well as every other item and everything froze well without any problems. I love that you give the weight of the ingredients. It is so much easier to weigh than measure. Thanks for this recipe!! Hey Janine, Oh thank you so much for the detailed review! That’s so wonderful you love it so much. Hey Angela, just coming back to say how much I like this smoothie bowl. I’ve not used ginger much, but I’m really starting to like it, all thanks to this bowl :) I really want to try some of the smoothie bowls in your book (already tried and love the Chocolate Dreams one), but am having a hard time pulling myself away from this one. Yay, that’s wonderful you love it so much! It really is a nice use of ginger. I want to try it with some fresh peeled turmeric sometime too. I get on smoothie kicks myself and don’t want to make anything else. If you have my second book you should try the reset button smoothie…it’s a nice refresher too. Will do! I looked at the reset smoothie recipe this morning and will try it out. It does look and sound refreshing! I’m trying to make all the recipes in your second book by the end of this year (I got the book for Christmas). I’ve made a good dent in it so far – I randomly open up to three pages throughout the week and make those recipes. I always see fresh turmeric at the grocery, but have never tried it. Your thought may give me a push! (And I’m liking another commenter’s suggestion to leave the ginger unpeeled – I didn’t know the peel was edible. Hey Angela, just wanted to pop back to say I tried this smoothie bowl with peeled fresh turmeric instead of ginger, like you mentioned. It’s fantastic, so thanks for mentioning it! It was my first use of fresh turmeric. I used a bit less than the amount of ginger called for in the recipe, since I wasn’t sure if it would be an equal swap. I may try to increase it next time around. Hey Laura, Oh so glad the fresh turmeric worked out! I have some in my fridge right now and I’ve been popping it into smoothies for a little anti-inflammatory boost. :) Thanks for letting me know! Angela – Seriously. I’ve had this smoothie bowl every morning for the past 2 months. And also had it with dinner instead of a raw green soup sometimes, too. And I’m still making my way through your most recent book, but seems I keep making the same recipes (a pattern!) because I can’t move on. The cracker recipes are probably my favorites, right after the Peanut Better Balls – those are all so good! Thank you for your hard work for us all! Wow! Made this recipe for my family and it was delicious. I love how the mango makes the smoothie so creamy. I too like to add fresh tumeric to my smoothies for all of it’s antioxidant and health benefits. I have learned so much from reading this book about all of the amazing benefits tumeric has to offer. Just had an idea for the dates if they are not fresh, you could soak them in boiling water until soft, use the soaking water when cooled as part of the water in the recipe. I like the idea of the coconut water as well. Your books are my kids’ favorites, they often browse through them to find something new to make. I’ve started making smoothies for them in the morning, because they are teenagers and “too busy” (aka they don’t want to wake up early) to eat breakfast. I generally do a smoothie and a something else for the young one who is starving in the morning. But this sounds lovely for a weekend breakfast. I’m not big on smoothies myself. I try but I like the pleasure of chewing my food… so maybe a smoothie bowl would work for me. As an aside, the other morning after I stayed up too late and got up too early, I was making a frozen berry and coconut yogurt smoothie and it looked like ice cream. Added more coconut yogurt and it had too much of a yogurt taste. Next time I will just call it a smoothie bowl and add some extra frozen fruit and granola on top. I make a batch of your granola at least once a week, stored in a mason jar and whenever I turn around it is gone…. Hey Kit, Wow, that’s so wonderful to hear…thank you so much for letting me know! I love a good smoothie bowl too. Adding all kinds of toppings makes it new and fresh each time. I can’t wait until summer when berries are delicious and abundant again. And I love that you make a batch of granola each week. Do you have a favourite granola recipe of mine? I love the nutty granola clusters from book 1 and the cherry hazelnut granola from book 2. This looks delicious. Great idea. I’m going to try it. What is one serving size for this and calories? I am so excited to try this tomorrow for breakfast! It looks so good! So delicious and looks great too. Makes healthy eating look good, which is incredible. I think everyone should learn to make this smoothie bowl, just to recover from holiday overindulgence. Would love to see more of these recipes, please keep them coming.